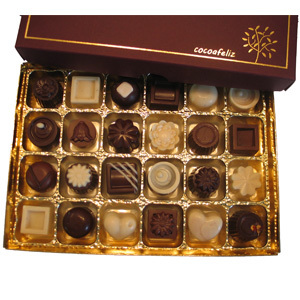 Cocoafeliz produce fine filled chocolates, using natural organic ingredients such as fruits and spices to create delicious flavours in dark, milky and white chocolate. Cocoafeliz does not use any artificial flavourings or preservatives, and all of our chocolates are suitable for vegans and vegetarians. We do not use dairy, soy or gluten as ingredients in any of our products. Browse our online shop to explore our full range of chocolates. We offer a unique ‘My Selection’ box – simply choose your box size, and then fill it with your own selection of chocolates from our full range. You can have a box of all your favourites – all the same, all different, or any combination! We know it can be difficult to choose sometimes, so if you prefer, you can select ‘surprise me!’ for any of the chocolates in your box, and we will choose something for you. Alternatively, we also offer speciality collections, with a mixture of chocolates on a theme, such as fruity truffles, or caramels. We also offer a range of fun solid chocolate shapes, including turtles, dinosaurs and butterflies, coloured only using natural organic vegetable colours, and perfect for children of all ages. We hope you enjoy your choice!